Finding the ring of your dreams has never been as easy as exploring the diverse selection at JustMensRings.com. With hundreds of affordable solutions in a wide range of metals and settings, we guarantee that you will find a ring to love for a lifetime. 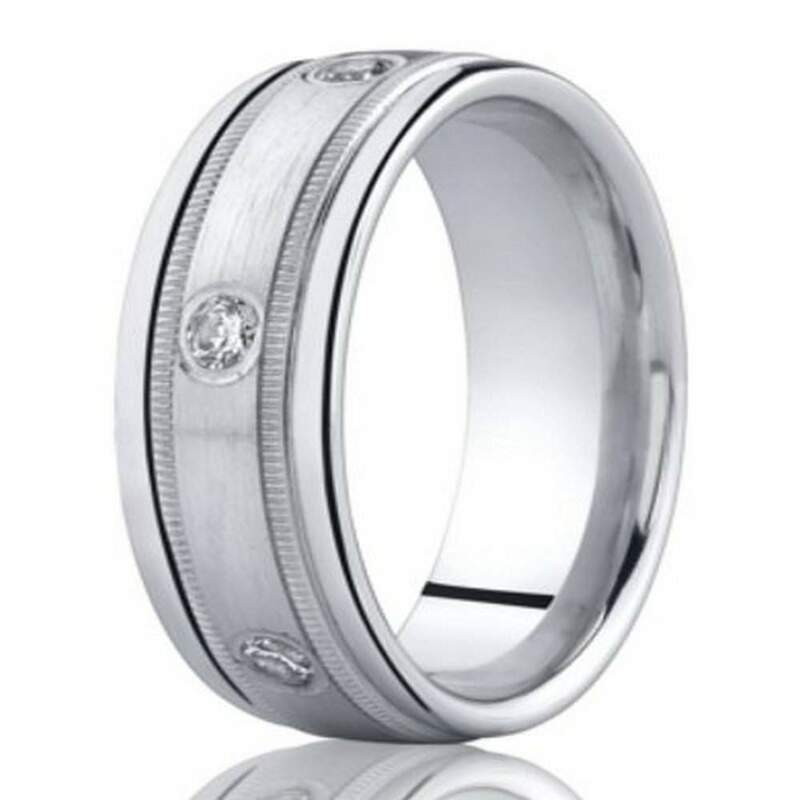 Discover our 950-platinum bezel-set diamonds men’s wedding ring. With six glittering diamonds to appreciate at any hour of the day, this ring is sure to remind you of the most beautiful celebration of your life. Platinum is the rarest of the precious metals, and it boasts a lot of advantages over gold or silver. If you are searching for durability and that supreme alabaster shine, look no further than our 8mm men’s 950-platinum bezel set diamond wedding ring. In this wedding band, platinum’s cool white luster accentuates the brilliant sparkle of bezel-set diamonds. Our customers love the comfort-fit band because it can easily slip over a larger knuckle when needing to take your 950-platinum bezel-set diamonds men’s wedding ring on or off for work or odd jobs around the home. The slightly domed band will not irritate your fingers, providing lasting comfort to enjoy all day long. What makes this ring even more remarkable are the exquisite milgrain details bordering the satin finish and polished round edges that provide the perfect amount of decorative embellishing to enhance any sophisticated or street-ready look. Commemorate the love you two share by adding a custom engraving to your 8mm men’s 950-platinum bezel-set diamond wedding ring before finalizing your order.